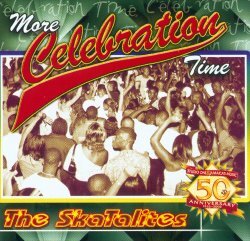 First CD issue of the original Celebration Time (mid sixties) album on Studio One. Has five bonus tracks not included on the original album. It is worth this alone for the additional 4 vocals. Two great vocal tracks by Lord Creator "Precious Time" shuffles along with a brass response from the Skatalites. Apart from the well known title track Celebration Time the bonus instrumental "Suffers Choice" pounds on every Ska wave beat. CD issued to commemorate Studio One & Jamaica Music 50 Anniversary 1952 - 2002. Brief notes by Lou Gooden. This CD issued on Studio One SOCD21073 (USA).